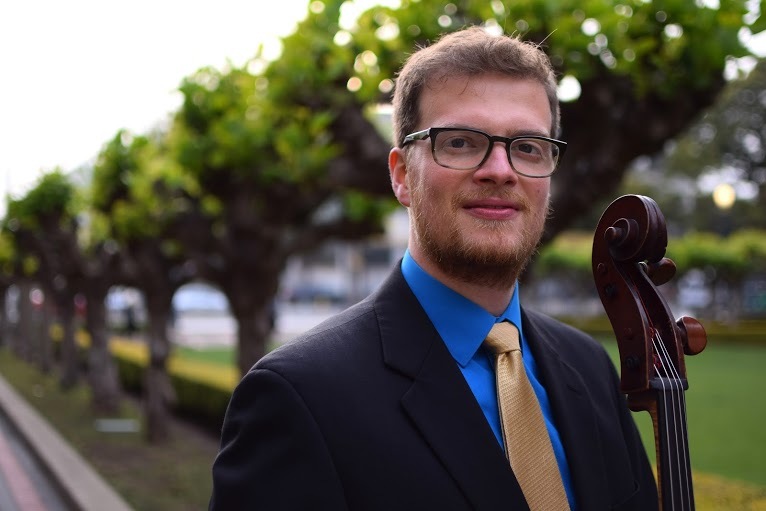 James Jaffe‘s goal as a cellist is to connect with composers, colleagues, and audiences. His performances have been heard on Cleveland’s WCLV 104.9, Virginia’s WVTF 89.1, and streamed live from the Norfolk Chamber Music Festival. James has been a featured soloist with CityMusic Cleveland, the National Repertory Orchestra, the Stockton Symphony, St. John’s Chamber Orchestra, and the Diablo Symphony Orchestra. During the past year he has performed frequently at Groupmuse events, including a sold-out performance of Schubert’s Death and the Maiden at the Bay Area’s first Massive Muse. James has spent summers performing at the Aspen Music Festival, the Casalmaggiore International Festival in Italy, and the Astona Academy in Switzerland. He has also appeared in chamber music concerts at Beijing’s Central Conservatory of Music, the Trinity Alps Chamber Music Festival, and for Musical Upcoming Stars in the Classics. James’s captivation with contemporary music has led to a collaboration with Pulitzer Prize-winning composer Steven Stucky, a series of performances of Khse Buon by Chinary Ung, and the development of Peregrinations for Solo Cello with San Francisco composer Kyle Randall. A chamber musician at heart, James has collaborated in performance with Geoff Nuttall, Ian Swensen, Jodi Levitz, Masumi Per Rostad, Kristopher Tong, Carol Wincenc, Chen Zhao, and Don Ehrlich. He was also a founding member of the Thalia Quartet, based in Cleveland, w2hich presented a series of twenty outreach concerts in Canada and was featured at the Robert Mann String Quartet Seminar in New York. His chamber music mentors include members of the Juilliard, Cleveland, Takacs, Tokyo, Vermeer, Emerson, Brentano, Borromeo, Kronos, Artis, Cavani, and Concord Quartets. James is fortunate to have studied the cello with Louise Saunders, Milly Rosner, Richard Aaron, Stephen Geber, and Jennifer Culp. He has earned performance degrees from the University of Michigan and the Cleveland Institute of Music, and an Artist Certificate in chamber music from the San Francisco Conservatory.